Happy November! Fall is peaking through lower elevations and moving past peak in some higher elevation areas. With a few weeks left to get out and see the last of the fall color all over Oregon, make sure you’re following #ORFallFoliage on Instagram to see the best Oregon has to offer. If you’re in Portland head to the Hoyt Arboretum or the Japanese Garden for fall trees and check out the Festival de dia de Muertos. On November 3rd, check out the Cider Fest in Independence, just outside Salem. OR, head on over to Eugene and check out the colors along the Willamette River and Alton Baker Park. If you want something a little different head to Cottage Grove and mix some covered bridges with your fall foliage. In Medford they are seeing many shades of red, orange, and yellow from the leaves falling to the ground, just in time for the 14th Annual Brews and Boogie. No matter where you find yourself in this beautiful state, you can still experience fall. Watch out next week for our top photos of Fall recap post! For fall foliage updates on our hotline, call 800-547-5445 and follow our Instagram for any additional updates at @orfallfoliage. 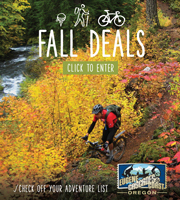 Don’t forget to tag us in any of your lingering Oregon fall foliage photos! A huge thanks to all the leaf reporters for a great fall foliage season and keep following along on Instagram as we recap the season and gear up for next fall! Catch Oregon Fall Colors Now! Hey, Fall Foliage followers! There are lots of ways to see fall all over the state of Oregon and lot of spooky events happening all around. After you spend the day viewing the leaves there are plenty of events to check out, from spooky to fall harvest to all things pumpkin. Salem and Eugene are in peak, and are also starting to see some of the trees lose their leaves. Once you enjoy a stroll around seeing all the fall foliage, head to one of the great Halloween or harvest events happening throughout. Scarousel Bash– Salem, October 27th– Salem’s Riverfront Carousel will host its annual Scarousel Bash. The event will feature carousel rides, themed activities and prizes. Stayton Ghost Tour and Chocolate Walk, Stayton, October 27th, A guide in Victorian costume will share the history and stories of Stayton. Participants will receive chocolate treats from each of the stops along the way. Tickets must be purchased in advance. Halloween Coffin Races, Eugene, October 27th, The City of Eugene is putting on an inaugural Halloween-themed Soapbox Derby, with coffins set to race down Shelton McMurphey Blvd on the south side of Skinner Butte. The road will transform into a ghoulish racetrack full of fierce competition. Portland’s fall is nearing peak. It’s a beautiful time to spend some time in Portland. The yellow and red is appearing along the waterfront and the foggy mornings are rolling in. All-in-all, a great time to walk around the city, check out the nearby Hoyt Arboretum, and then head to one of the many festive events happening this week. Killer Pumpkin Festival, Portland, October 27th, Rouge Eastside Pub and Pilot brewery, Pumpkin beers by independent brewers will be on every tap at Rogue Eastside Pub & Pilot Brewery for the 2018 Killer Pumpkin Festival, part of Brewpublic’s Killer Pumpkin Week. Tombstone Trick or Treat, Portland, October 27th, Lone fir Cemetery, Tombstone Trick or Treat is a free, family-friendly Halloween trick-or-treat party. Mt.Hood is in full peak, lots of gold, red, and orange colors. Take a drive on Lolo Pass Road, or a hike through the Mt. Hood National Forest. After a day of exploring the fall foliage, head to Philip Foster Haunted Farm for some Halloween fun! Philip Foster Haunted Farm, Eagle Creek, Oct 27th, The pioneers may not have celebrated Halloween, but there are spooky stories to be told at Philip Foster Farm. Learn about some of the ghostly characters of Eagle Creek’s past. 6-8pm. $5/person or $20/family. Medford is in peak, full of red, orange, and golden yellow colors. A great weekend for a hike to the three waterfalls, Pearsony Falls, Mill Creek falls, and Barr Creek falls, all within a mile from each other. Another great way to see the fall colors is to enjoy the drive south on Highway 62. Bend may be past peak in their fall foliage, but there’s still plenty to do and see in Drake Park. Check out some of there great events happening this weekend. Worthy Brewing’s Dance of the Dead, Bend, October 26th, Live music by Lyrics Born, Local DJ’s, and day of the dead themed décor, food carts, and award-winning beer. Happy middle of October, everyone! With the weather staying warm and sunny, it’s a great week to explore the state and get in the fall spirit while checking out the lovely fall foliage around us. Almost any region you pick this weekend will be showing full foliage and beautiful weather! Willamette Valley- The Willamette Valley seems to be in peak from Salem to Cottage Grove, the fall foliage is stunning all around. Bright reds, golden yellows, and orange all over. With the warm days and cool nights, and little rain in sight, I am hopeful that the fall foliage will stick around. A walk-through Riverfront park in Salem, a day at the Saturday Market (one of the last for the season) in Eugene, a stroll through Cottage Grove for all the covered bridges and fall foliage. Along with all the views of fall foliage, here are some fall events to check out if you’re in the area. Pumkinpalooza, Eugene, Oregon, October 19th, The Beir Stein. The Bier Stein will feature Elysian’s Great Pumpkin Roadshow with eight delicious pumpkin beers and a pumpkin firkin. Beer will be poured from a very large pumpkin which will be tapped at 7 p.m. Haunted Hike, Eugene, Oregon, October 20th. West Coast Giant Pumpkin Regatta, Tualatin, Oregon, Saturday October 20th. The Giant Pumpkin Regatta is one of the most anticipated fall events in the Northwest. Costumed characters, paddling 1,000 pound pumpkin boats, compete in a series of wacky races across the Lake of the Commons. Howloween, Portland, Oregon, October 20th. Portland Zoo. Halloween fun treats and educational activities. Laser Halloween, Portland Oregon, October 18 and more dates though the 31st, Omsi. Spooky lasers and ghoulish dances, Get into Halloween sprint with the spooky tunes at Omsi. Mt. Hood/Columbia River Gorge – The Columbia Gorge is in full peak, great time for a hike or a walk around town. Pumpkin patches and the fruit loop are full of produce and pumpkins! It is a great time to take a trip to the Gorge for all the foliage and fall fruit. Southern Oregon – Medford is going strong in fall foliage, it’s still in peak with deep shades of red, orange, and yellow; like a sunset of leaves. Plenty of great parks to check out all the fall foliage while you’re in Medford. Hawthorne park, Table rock, Jacksonville, or Lithia park. Along with all the places to view fall foliage, there are some great events to check out while you’re down there. Harry and David Harvest Festival, Medford, Oregon October 13th & 20th. Live music and samples. Child friendly activities such as face painting and decorating of their own pumpkins to take home. Rogue Valley Market, Ashland, Oregon, October 20th 8:30am- 1:00pm. Fruit, flowers, and veggie, 32 booths with crafts and food. Central Oregon- Bend Oregon is past peak, with warm and sunny days and cold nights there are still remaining leaves on trees. Check them out at drake park that is still a great fall foliage spot, Shevlin park, just west of Bend is still fill of gold aspens, and Western Larch/ Tamarack. Great time to hike the Deschutes River trail, which is south of Bend. Scaregrounds Haunted Houses, Redmond, Oregon October 19th at 7:00pm. For Ages 12 and up, three different haunting experiences starting at $15 for one haunt!